For SMA surface mount diode package, see DO-214. Figure 1. Standard male SMA connector: male body (inside threads) with male inner pin. SMA (SubMiniature version A) connectors are semi-precision coaxial RF connectors developed in the 1960s as a minimal connector interface for coaxial cable with a screw-type coupling mechanism. The connector has a 50 Ω impedance. SMA is designed for use from DC (0 Hz) to 18 GHz, and is most commonly used in microwave systems, hand-held radio and mobile telephone antennas, and more recently with WiFi antenna systems and USB software-defined radio dongles. It is also commonly used in radio astronomy, particularly at higher frequencies (5 GHz+). SMA connectors can be visually confused with the standard household 75-ohm type F coax connector (diameters: Male 7⁄16 inch (11 mm) circular or hex; female 3⁄8 in (9.5 mm) external threads), as there is only about a 2 mm difference overall in the specifications. Type F cannot be mated with SMA connectors without the use of an adapter. The SMA name is also used for a superficially similar optical fiber connector. The interface dimensions for SMA connectors are listed in MIL-STD-348. The SMA connector employs a 1/4-inch diameter, 36-thread-per-inch threaded barrel. The male is equipped with a hex nut measuring 5/16 inch (0.3125 inch / 7.9 mm) across opposite flats, thus taking the same wrench as a #6 SAE hex nut. The SMA connector uses a polytetrafluoroethylene (PTFE) dielectric which will contact along the mating plane. Variability in the construction and the mating of the connectors limits the repeatability of the connector impedance. For that reason and that they are just rated for a limited number of connection cycles, an SMA connector is not usually a good choice for metrological applications. SMA connectors are rated for up to 500 mating cycles, but to achieve this it is necessary to properly torque the connector when making the connection. A 5/16-inch torque wrench is required for this, set to 3–5 in·lbf (0.3 to 0.6 N·m) for brass, and 7–10 in·lbf (0.8 to 1.1 N·m) for stainless steel connectors. Flats are sometimes also provided on the cable side of the connector assembly so that a second wrench can be used to prevent it from rotating and damaging the joint to the cable. It is also advisable to inspect and clean out loose debris from the internal surfaces with compressed air or a gas duster can before mating. The SMA connector is typically rated for mode-free operation from DC to 18 GHz, though some proprietary versions are rated to 26.5 GHz. For performance above this, SMA-like connectors are used. These are the 3.5 mm connector, rated to 34 GHz, and the 2.92 mm (also known as 2.9 mm, K type, or SMK), good up to 46 GHz. These connectors keep the same outside thread as the SMA, so they can potentially be cross-mated, but the precision connector can be easily damaged when mating with low-grade SMA connectors. The precision versions use an air dielectric with appropriately scaled center conductors. Beyond 46 GHz, the 2.4 mm, 1.85 mm (also known as V type) and 1.0 mm (also known as W type) connectors exist. These are similar to the SMA connector, but with the geometries incompatibly scaled. (But 2.4 mm and 1.85 mm connectors are compatible to each other.) These have mode-free operation to 50, 65, and 110 GHz respectively. Figure 2. Female RP-SMA connector: Female connector body (outside threads) with a male inner pin contact. A male RP-SMA connector is the opposite in both respects — male connector body (inside threads) with a female inner sleeve contact. 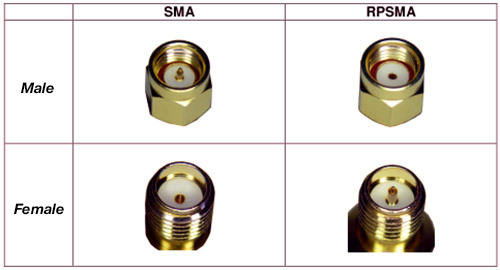 Reverse-polarity SMA (RP-SMA or RSMA) is a variation of the SMA connector specification which reverses the gender of the interface, as shown in Figures 1 and 2. The term "reverse polarity" here refers only to the gender of the connector's contact pin, not in any way to the signal polarity. The female RP-SMA connector has the same external housing as a standard or conventional female SMA connector, which consists of an outer shell with the threads on the outside; however, the center receptacle is replaced by a male pin. Similarly, the RP-SMA male has threads on the inside like a conventional male, but has a center receptacle instead of the male pin in the middle. Normal SMA connectors are incompatible with RP-SMA connectors. RP-SMA connectors have been widely used by Wi-Fi equipment manufacturers to comply with specific national regulations, such as those from the FCC, which are designed to prevent consumers from connecting antennas which exhibit gain and therefore breach compliance. However, by 2000, the FCC regarded the connectors as readily available, though delaying its ruling indefinitely. As of 2018, leading manufacturers such as Netgear and Linksys are still using RP-SMA connectors on their Wi-Fi equipment. ^ RADIO FREQUENCY CONNECTOR INTERFACES FOR MIL-DTL-3643, MIL-DTL-3650, MIL-DTL-3655, MIL-DTL-25516, MIL-PRF-31031, MIL-PRF-39012, MIL-PRF-49142, MIL-PRF-55339, MIL-DTL-83517 (B with change 3 ed.). US DOD. 2017-01-22. ^ "SMA Dimensions". showmecables.com. Retrieved 2015-08-29. ^ "What Mates With What". Keysight.com. Retrieved 2017-12-27. ^ "SMA Connectors" (PDF). AmphenolRF.com. Archived from the original (PDF) on March 31, 2010. Retrieved February 7, 2016. ^ "Inspection". Agilent.com. Retrieved 2014-06-02. ^ "Inspecting Connectors". Keysight.com. March 2, 2007. Retrieved 2014-06-02. ^ "Terms - C". Web.archive.org. 2011-12-23. Archived from the original on July 30, 2012. Retrieved 2014-06-02. ^ "Mating Rules for SMA, 2.92mm, 2.4mm, & 3.5mm connectors". Web.archive.org. 2013-08-05. Archived from the original on August 6, 2013. Retrieved 2014-07-31. ^ "Reverse Polarity SMA Antenna Cable". DataPro. Retrieved 2014-06-02. ^ "RP-SMA Coax Connectors :: Lighthorse Technologies INC". Coaxconnector.com. Retrieved 2014-06-02. ^ "RF Connector – RP SMA Connector Introduction". Wellshow.com. Archived from the original on March 29, 2013. Retrieved February 7, 2016. ^ "47 CFR 15.203". US Code of Federal Regulations. Retrieved February 7, 2016. ^ "OET clarifies antenna connector requirements for Part 15 Unlicensed Transmitters" (PDF). FCC.gov. Federal Communications Commission. May 22, 2000. ^ "OET extends effective data of antenna connector requirement indefinitely" (PDF). FCC.gov. Federal Communications Commission. September 28, 2000. ^ "HGA7S Support | High Gain Antenna For SMA Connectors". Linksys.com. Archived from the original on 2014-01-16. Retrieved 2014-06-02. Radio-frequency connectors. Part 15: R.F. coaxial connectors with inner diameter of outer conductor 4.13 mm (0.163 in) with screw coupling — Characteristic impedance 50 ohms (Type SMA). International Standard IEC 60169-15, 1979. Connectors, plug, electrical, radio frequency. Military specification sheet MIL-C-39012. Wikimedia Commons has media related to SMA connectors.